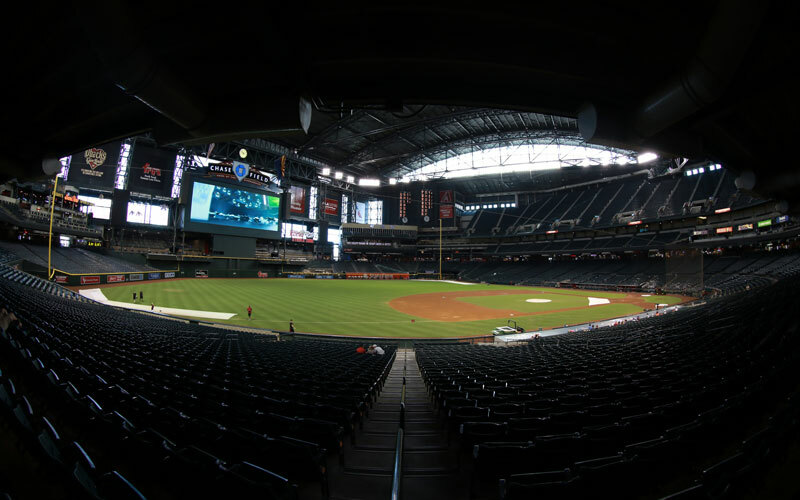 (Taken with a fisheye lens) The interior of Chase Field is pictured Sunday Aug. 30, 2015 in Phoenix, Arizona. Chase Field is home of the Arizona Diamondbacks. Graham Rossini spent four years as an intern shadowing Arizona State University’s baseball coach at the time, Pat Murphy. As a student at the W.P. Carey School of Business, Rossini was immersed in the day-to-day happenings of the baseball program. Rossini eventually became the university’s baseball operations director and worked another six years alongside Murphy, who was known as one of the most accomplished coaches in ASU baseball history before he was forced to resign, according to azcentral.com. Fast forward seven years, and the two found themselves on competing sides for the first time. Rossini now works as the vice president of special projects and fan experience for the Arizona Diamondbacks. On June 16, the team faced off against the San Diego Padres and Murphy, who served as interim manager after the team fired Bud Black that week. Rossini called it “the happiest, weird moment” of his career. Rossini still uses many of the skills he learned under Murphy’s tutelage. Rossini wears several hats on the business operations side of the Diamondbacks – from acting as point person in coordinating events that Arizona has hosted like the All Star Game or World Baseball Classic, negotiating with Chase Field vendors and restaurants, or overseeing community outreach programs like the Diamondbacks baseball academy. In September, the Phoenix Business Journal named Rossini to its “40 under 40” Class of 2015, which recognizes influential area professionals. 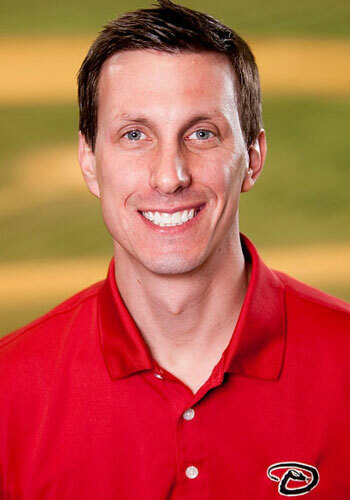 Rossini still assists the ASU baseball program as a consultant to his successor at Arizona State, Director of Baseball Operations Brendan Cunningham. Rossini implemented the “Tequila Sunrise” throwback uniform into the regular ASU baseball wardrobe, a favorite of both players and fans. He also was instrumental in recruiting top-caliber talent to the program, including a pair of All-Stars in Andre Ethier and Dustin Pedroia, as well as several others currently playing in MLB. ASU appeared in the College World Series twice in Rossini’s tenure with the team. Jeff Evans, a former ASU baseball sports information director and current Seattle Mariners assistant director of baseball information, said Rossini is one of the most respected individuals in his profession. In his time at ASU, Rossini’s job included honing in on minute details – from the sharpness of the logos on the baseballs to planning logistics of team travel, lodging and meals on the road. He turned his focus to improving fan experience at the Diamondbacks in 2008. Fans can see the results of Rossini’s work throughout the stadium’s concourse. He helped secure a partnership with Levy Restaurants and also sought to expand dining options for fans to include local favorites like America’s Taco Shop, Lo-Lo’s Chicken and Waffles, Paradise Valley Burger Co. and Zoyo Neighborhood Yogurt. The restaurant upgrades addressed one significant element of Rossini’s vision to improve the environment at the ballpark by adding flavor and more choices to the stadium’s concession fare. Fan Cost Index (listed in bold) comprises the prices of four adult average-price tickets, two small draft beers, four small soft drinks, four regular-size hot dogs, parking for one car and two least expensive, adult-size adjustable caps. In April, the Draft Room opened, replacing the Arizona Baseball Club. The new venue offers beer aficionados a variety of both local and regional craft brews as well as a panoramic view of the park from right field. In 2014, the team renovated some of its box suites and added seating and furniture to the Coors Light Strike Zone on the right field concourse, which features a pool table and full-service bar, according to a news release. This past season, the Diamondbacks debuted “Throwback Thursday” uniforms with the franchise’s original purple and teal color scheme, a marketing campaign targeting both social-media savvy millennials and fans who have supported the team since its inception in 1998. Other promotions, such as Hispanic Heritage Day and College Nights, were scheduled with similar target demographics in mind, aiming to increase attendance in the latter part of the season. At 48,633, Chase Field has the fifth-largest seating capacity among baseball stadiums in North America, trailing Rogers Centre in Toronto, Coors Field in Denver, Turner Field in Atlanta and Yankee Stadium in New York. Yet, only Atlanta had worse attendance than Arizona in 2015 among that group. Chase Field was filled at about halfway on average, and ranked 23rd in overall attendance of 30 MLB teams. Filling seats is a unique challenge for the franchise, which is less than two decades old. Rossini has embraced the tough task of converting young fans whose parents may have grown up elsewhere and worked to cultivate new (and ideally lifelong) Diamondbacks fans. Many Valley residents grew up rooting for teams in Chicago, Los Angeles or San Francisco. But their children, Rossini said, will grow up wearing Sedona red. And more than likely, so will their grandchildren, he said. After the Diamondbacks finished with the league’s worst record in 2014, the front office put an emphasis in improving the product on the field. The team hired a Hall of Fame caliber former manager in Tony La Russa as chief baseball officer and a new general manager in Dave Stewart to work under him. The Diamondbacks won 15 more games in 2015 than they did last year. While that wasn’t good for more than third place in the National League West, there’s much more at stake for Rossini and the organization than just on-field success. 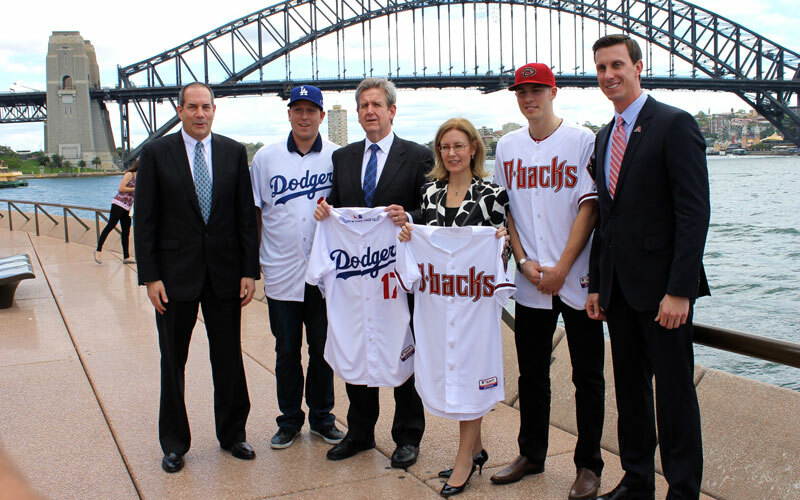 The Diamondbacks have 13 years remaining on a 30-year lease with Maricopa County Stadium District on Chase Field. The capacity may be reduced in the future, and seats could be widened at the club level in the bleachers – the club opposes covering up empty seats with a tarp, as some smaller market teams have done, according to azcentral.com.